The most hated bull market of all time? At the end of the day, equity returns are driven by ROE, and we argue in this month’s Absolute Return Letter that ROE is likely to drop as 2018 unfolds, partly due to rising inflationary pressures – particularly wage inflation – and partly due to rising borrowing costs. Perhaps more surprisingly, the new US tax reform could also negatively affect ROE. Continue to read if you want to understand why. Bull-markets are born on pessimism, grow on scepticism, mature on optimism and die on euphoria. Before I go into this month’s topic, allow me to share something with you that has dominated my life over the past two years. I have just finished my first book (… and also my last, according to my wife! ). Harriman House – the UK’s leading independent publisher of investment books – will be publishing it and, if everything goes to plan, the book will be released on the 26th March. At the moment, I am like a child, just about to open my first Christmas present. I have chosen to call the book The End of Indexing. Indexing – i.e. passive investing – is clearly the flavour of the day. It now accounts for around one-third of the total US mutual fund market and continues to grow rapidly – both in the retail and in the institutional sphere. The trend towards indexing appears to be unstoppable but, in The End of Indexing, I present a different vision. I argue that, in the economic environment we are entering, indexing is not the way to go. In conjunction, those six trends have the potential to create conditions resembling the perfect storm, which will result in low economic growth for decades to come. Investment techniques and methodologies – including passive investing – that have worked so well in the bull market of the last 35 years will no longer deliver acceptable returns. I don’t discuss the shorter-term cyclical outlook at all (which is pretty good). The focus is on those six structural trends, and I argue that a new investment approach is called for. The End of Indexing provides investors with a guide to the challenging environment ahead. Next month I will provide links to a couple of websites where you can buy the book. Many say the Global Financial Crisis erupted in earnest in 2008; however, I wouldn’t argue too much with those who claim that it all started with the problems faced by two subprime hedge funds managed by Bear Stearns in the summer of 2007, even if equities only felt the full impact more than a year later. Nine months later, it was all over. On the 15th March 2008, JP Morgan offered shareholders of Bear Stearns $2 per share for a company that had traded at $150 per share only a year earlier. The terms were accepted by the board of directors of Bears Stearns the following morning, and investors all over the world were mightily relieved. Now we could all return to what we thought we did so well, and that was to make money off the great bull market. Let’s not confuse genius with bull market, as my former boss always reminded me. Little did we know that it was going to get a lot worse in the months and years to come. Today, a decade after Bear Stearns blew up, the ramifications of the Global Financial Crisis are still felt every single day. Extraordinarily low interest rates are only the tip of the iceberg. In so many ways, it is such a different world we wake up to every morning compared to the world we knew, and came to like, in pre-crisis times. Another thing that has changed in recent years is the investment community’s relationship with the Fed. To put it mildly, American investors have developed an obsessive love affair with the Fed. Anything the Federal Open Market Committee (FOMC) does is rewarded by investors, and I mean anything. In fact, they don’t need to do anything at all. As long as an FOMC meeting is held, investors get carried away. Before 1982, the days on which the FOMC convened were just like any other day in the US equity market, but that changed with the arrival of the Great Bull Market. Since 1982, a full one quarter of the total cumulative return on US equities has been delivered on the eight days a year that the FOMC have met, regardless of whether interest rates have been lowered or not. Even more noticeable, in the first few years following the Global Financial Crisis, the performance of the S&P 500 on the days that the FOMC convened was no less than 29 times higher than the average daily return (Exhibit 1). Many things work quite differently today when compared to pre-crisis times, and investors need to adjust their strategy accordingly, if they want to succeed in the New Normal. Having said that, I wouldn’t be surprised if this were all to change again, but something big must come down on all of us, before ‘normality’ can return. What do I mean by that? Think back to the last time we suffered a massive economic crisis – the Great Depression of the 1930s. That led to Hitler and to World War II, which effectively became the end-game of the previous debt super-cycle. As the war came to an end in 1945, the world in general, and Europe in particular, was in need of major reconstruction after six years of utter devastation. Much capital was needed to rebuild our continent, and debt-to-GDP began to rise. It has been growing ever since. It is the growth in debt-to-GDP that will have to come to a stop, which is why I think we are now coming to the end of the current debt super-cycle. Am I predicting another war? Not at all, but I don’t think we will finally leave the Global Financial Crisis behind us before something big happens. In the context of debt, big means debt destruction. Now, debt destruction has only ever occurred in one of two ways. Either defaults increase massively, like they did in the Global Financial Crisis or as they did back in the 1930s, or debt is destroyed through inflation. The best example of that would be the high-inflation years of 1966-81. Debt destruction has never happened in a benign way. Never! I am obviously not the only one who realises that the ongoing bull market is built on a rather thin foundation, which is why there are so many sceptics around; why so many are reluctant to throw their hard-earned money after equities. I am aware of countless investors (myself included) who sit on large piles of cash, as they remain convinced an accident is looming. I discussed the topic with John Mauldin only a couple of weeks ago, and he is of the opinion that, although he doesn’t disagree as far as the final outcome is concerned, there are currently too many sceptics around to cause markets to blow-up in the short term. As John pointed out, major sell-offs rarely happen until the last bear turns bullish (and, more often than not, he is right about that). John – I think you underestimate how bullish your compatriots are. You are correct that, here in Europe, more than a modest amount of scepticism is still prevalent, but most Americans – at least those I am in touch with – are so gung-ho. If you still don’t believe me, I suggest you look at Exhibit 2. In the January Absolute Return Letter, I submitted my top five worries going into 2018. Over the next few pages, I am going to share with you another concern I have. It is more technical in nature than the five I listed last month but no less disconcerting. (Note: Julien Garran of MacroStrategy Partnership LLP inspired me, when he published a paper called “Main St. vs Wall St.”). As you will see in a moment or two, it is certainly possible that the current bull market could be over quite soon – well before the last bear caves in. My story begins with DuPont – a US corporate listed on NYSE. All the way back in the 1920s, the management at DuPont developed a model to assess the company’s profitability. That model is called DuPont Analysis (Source: Corporate Finance Institute) and is used to this day to decompose return on equity (ROE) into the underlying drivers (Exhibit 3). ROE is the primary driver of EPS, which is the principal driver of equity returns, hence the importance. As you can see from Exhibit 3, the three drivers of ROE in the DuPont model are profit margins (the higher the better), total asset turnover (the faster the better) and financial leverage, which is measured as debt-to-equity (the higher the better when debt costs less than equity). Now, 2018 offers a challenging environment for all three ROE drivers. Firstly, net profit margins will almost certainly be negatively impacted by rising inflationary pressure. Profit margins are likely to fall as a result of limited pricing flexibility (due to globalisation) combined with rising raw material costs, higher wages, etc., whilst they will also be negatively affected by higher borrowing costs. Many argue that, as long as wage inflation remains modest, corporate expenses won’t rise meaningfully. The point they miss is that, when productivity is as low as it currently is, even modest wage inflation could have a significant impact on profit margins. Secondly, as far as asset turnover is concerned, I note that it almost always deteriorates when new capacity is brought online – i.e. when capex is increased. (Source: MacroStrategy Partnership LLP). Trump’s tax reform includes an incentive to grow capex, as it allows for a full tax write-off in year one. Consequently, US capex will almost certainly rise at the expense of buybacks (you can’t spend your free cash-flow more than once). In other words, buybacks could shrink significantly in size. The net impact of all of that is that an already low asset turnover ratio (Exhibit 4) could shrink further. Thirdly, as far as financial leverage is concerned, recent years’ low borrowing costs have encouraged corporates to take on more debt (Exhibit 5). That has benefitted EPS growth, as much of the additional debt has been spent on stock buybacks. Given overall financial leverage in US industry, even a modest rise in interest rates in 2018 could force companies to pay down debt. Furthermore, Trump’s tax reform incentivises US corporates to pay down debt, as a cap on interest deductibility is being introduced. 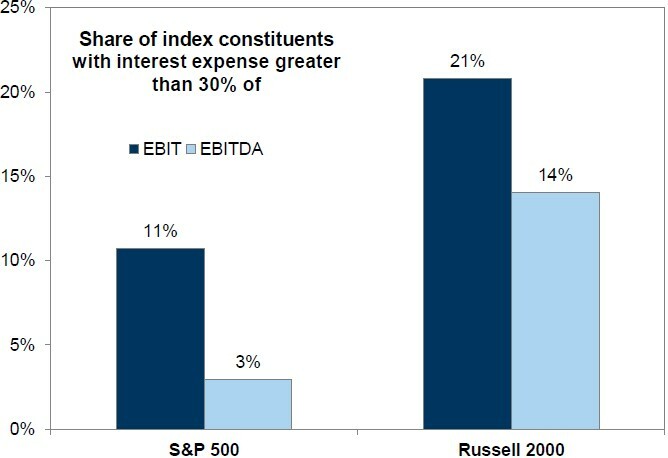 When exceeding 30% of EBITDA (through 2021) or EBIT (starting in 2022), interest expenses will no longer be deductible. That could cause a meaningful number of US corporates – particularly small-cap corporates – to switch their attention from buybacks to debt reduction (Exhibit 6). US companies have been the biggest buyer of US stocks since the financial crisis, and a change in corporate habits could have a meaningful impact on US equity returns. You should also know that, in addition to the companies included in Exhibit 6, another 5-10% of US corporates have debt-to-EBITDA in the high twenties. Those companies would probably also slow down their buyback activities. One final point on the ROE drivers. It is quite remarkable how US corporates have struggled to improve ROE despite much lower costs of debt in recent years (which is very positive for ROE). That could quite possibly be down to the significant drop in asset turnover which, as I just said, could shrink even further as a result of Trump’s tax reform. It is therefore hard to be overly optimistic about the outlook for US corporate earnings in 2018. Both ROE and EPS are likely to come under considerable pressure as 2018 unfolds and, unless American investors have really turned Japanese (a topic I discussed in the January letter), equity returns should be negatively affected. With that caveat in mind, I predict US equities to deliver returns this year that are inferior to equity returns in most other markets around the world. Adding to the woes of the corporate sector, the US household sector is also in some disarray. Personal outlays on interest expenses are now at a record high despite record-low interest rates, and US retail banks have reported a near 20% increase in losses on credit card debt in 2017 despite the economy doing quite well. Many consumers appear to be using their credit card to get from paycheque to paycheque. In that context, I note that CNBC recently reported that no less than 78% of American full-time workers now say they live paycheque to paycheque. What is effectively happening is that US consumers on average spend more than they earn but, before we gloat on this side of the Atlantic, I should point out that British consumers are not far behind. 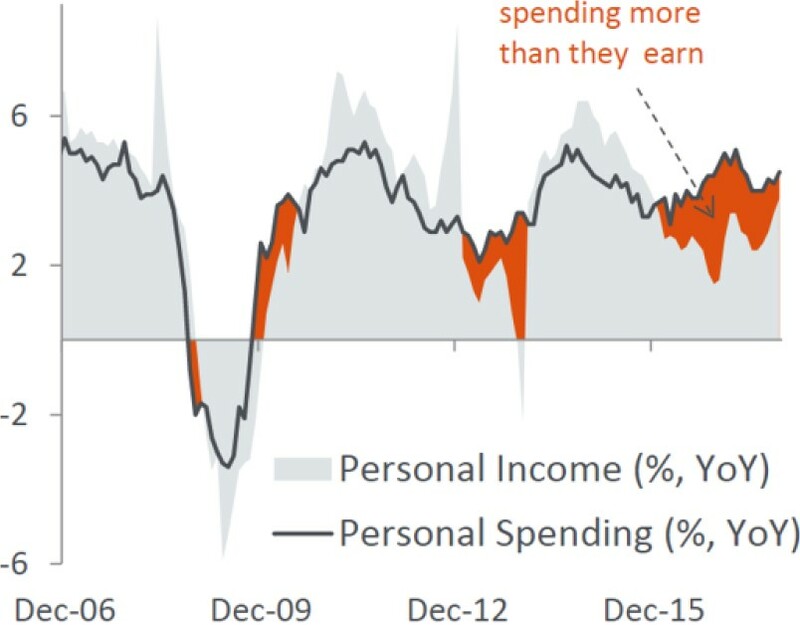 This has admittedly happened before but, over the past couple of years, US consumers have been dramatically outspending their own earnings (Exhibit 7). The over-consumption has given GDP growth a lift, but consumers can’t spend more than they earn forever. At the end of the day, all of the above boils down to a relatively simple conclusion. Because US corporates have underinvested in physical assets in the post-crisis environment – i.e. 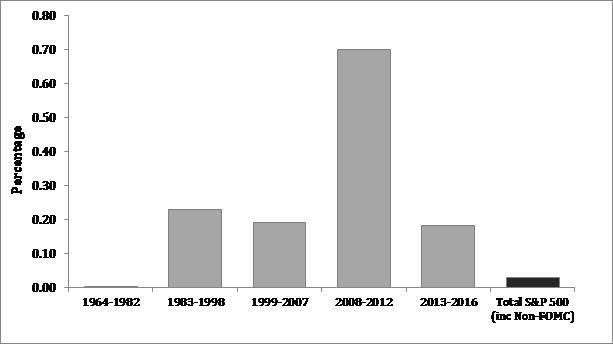 they have invested less than depreciation – ROE (and EPS) have benefitted, but only because the free cash-flow has been spent on buybacks instead. As an old Danish saying goes, that’s like peeing your pants to stay warm. Under-investing in physical assets will most definitely come back and bite you in the tail at some point. Could it happen in 2018?